(ă-per'tōg-nath'ē-ă), In the diphthong gn, the g is silent only at the beginning of a word. 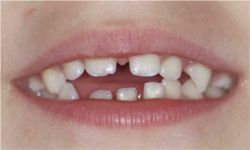 An open bite deformity, a type of malocclusion characterized by premature posterior occlusion and absence of anterior occlusion. Another term used in describing AOB is apertognathia. Mandibular condylosis and apertognathia as presenting symptoms in progressive systemic sclerosis. Frost DE, Fonseca RJ, Turvey TA, Hall DJ, Cephalometric diagnosis and surgical orthodontic correction of apertognathia. 8-10) An enlarged tongue resulting in apertognathia and tooth indentations along the lateral border can be the first clinical sign of primary amyloidosis. Apertognathia (open bite, artichoke bite) is a less common cause of facial deformity.